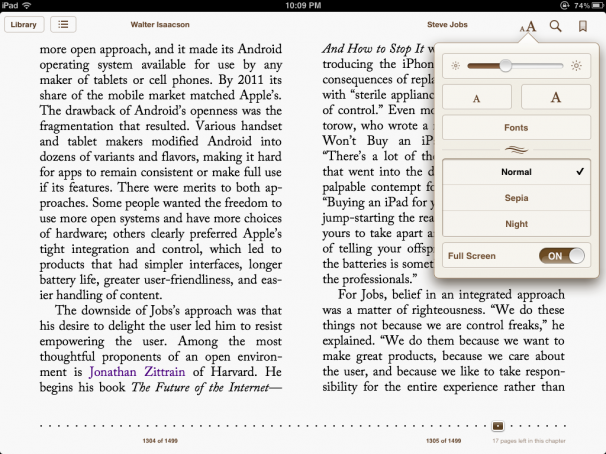 Using iBooks to read Walter Isaacson's book Steve Jobs left me with a healthy distaste for the program. 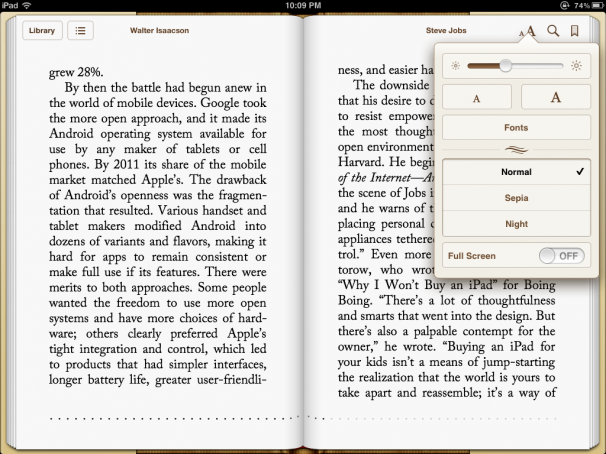 As an eReader it is subpar compared to Amazon's Kindle App1. There are formatting bugs that occasionally pop up, and I find the interface too cluttered. The metaphor of a book is cute at first, but quickly becomes distracting. It constantly gets in your face and breaks your concentration. Instead of becoming immersed in the reading experience, iBooks constantly demands that you pay attention to how clever it is. I have been wanting a full-screen mode that does away with the book metaphor, so I was pleasantly surprised when I check the App store tonight and found an iBooks update waiting. The main new feature is a distraction-free full-screen option! This new option can be selected by first clicking on the text icon in the top right-hand corner as shown in the figure below. 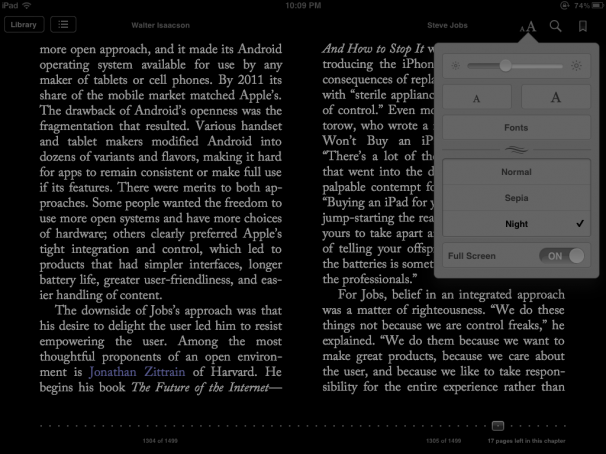 At the bottom is a switch that enables the new full-screen view. Turn this on and the book background disappears. It's not perfect, but it is still a big improvement. There is also a new night mode. This reverses the colours, making it easier on the eyes at night. I'll definitely be using this feature to read in bed. A very welcome iBooks update. I hope that a future update will include an option to disable the page turning animation.